In exactly four months, hundreds of thousands of people will descend upon Wichita to celebrate one of the most popular sports in the country: college basketball. With 64 teams vying for a spot in the final championship, only one will reign victorious at the end of a long three-week battle royale, likely to be filled with upsets and underdogs. But the tradition of the NCAA Tournament didn’t start so competitively, nor did it bring in so many visitors. It began in 1939 with only eight teams invited to play for the first 12 years. The University of Oregon beat Ohio State University 46-33 to become the first tournament champion. The competition did not determine which college team ranked supreme – it was simply just another tournament. It wasn’t until 2001 that the current tournament format was adopted. Nearly 80 years ago, the National Invitational Tournament (NIT) was in charge of picking a national champion. Today, many years after the NCAA Tournament grew from those first eight teams, 68 are now invited to play and the winner is recognized as the top dog in the nation. The UCLA Bruins have become the most winningest team in NCAA Tournament history with 11 championships, followed by the University of Kentucky with seven and Indiana with five. Of the 68 spots in the NCAA Tournament, 32 teams gain automatic entry through winning their conference&apos;s championship. The remaining 36 teams are called at-large bids and are chosen by the Division I men&apos;s basketball committee made up of athletic directors and conference commissioners. The committee also seeds the teams and places them into four regions (East, West, South and Midwest), all of which is announced on Selection Sunday. A few days after Selection Sunday, the last eight teams on the overall seed list play in the “First Four” – playing for their chance to get to the first round of games played among the main 64-team bracket. Once the pool is trimmed to 64, the tournament officially begins. Each of the regions has two locations for the first weekend of games, during which the first and second round games are played. For example, eight teams seeded in the Midwest Region will travel to Wichita and the other eight will travel to Dallas to play their first and second round games. At the end of the first four days of tournament play, the field is whittled down to the top 16 teams. The Sweet 16 teams advance to the next weekend, where the competition takes place at four regional sites. The teams are pared down to the Elite Eight before four teams emerge from that weekend to play the following weekend in the Final Four, competing for the title. 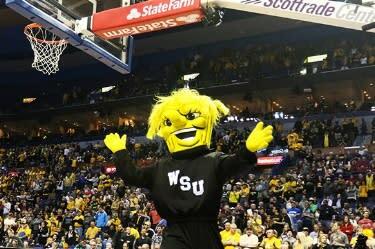 Wichita State University men’s basketball has made 14 appearances in the NCAA Tournament and has reached the Final Four twice, the Elite Eight four times and the Sweet 16 six times. The Shockers have been in the tournament for six straight years starting in 2012, with their highest finish coming in 2013 after they made an improbable run to reach the Final Four as a No. 9 seed. They lost 72-68 to eventual champion Louisville. Their other Final Four appearance came in 1965, when Wichita State lost to UCLA 108-98. The Bruins went on to claim the title. The Shockers earned a No. 1 seed in the NCAA Tournament in 2014 after becoming the first men&apos;s Division I team ever to finish the regular season 31–0. They took a 34-0 record into the tournament; however, they faced an under-seeded University of Kentucky team in the second round. They lost 78-76 in what many called a championship-caliber game. Kentucky went on to play in the championship game, falling 60-54 to UConn. 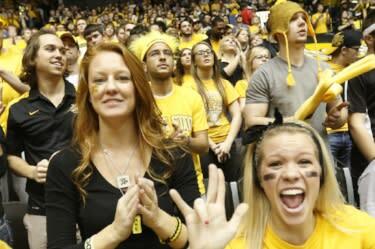 Expectations are high again in Wichita this year as the Shox started the season ranked No. 6 in the country. 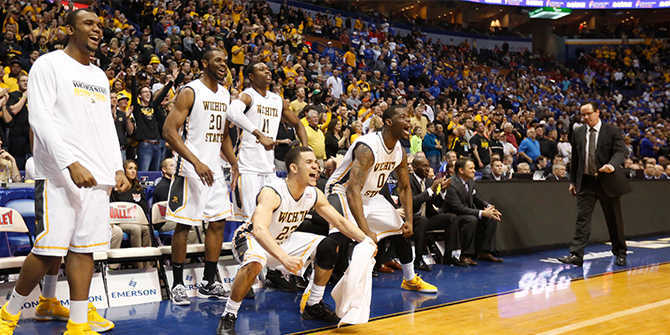 One thing is certain, though: you won’t see Wichita State playing in the NCAA Tournament in Wichita. The university is considered the host school for the games at INTRUST Bank Arena, which means Wichita State will be sent to another location if the team makes the field of 64. In less than 120 days, the first and second rounds of the 2018 NCAA Men’s Basketball Championship will roll into Wichita bringing a highly competitive group of college basketball players, families, fans, visitors and locals to INTRUST Bank Arena. Whether you’re attending the game or not, there are tons of activities you can enjoy in downtown Wichita, including a rich shopping scene, cultural exhibits and vibrant nightlife opportunities.